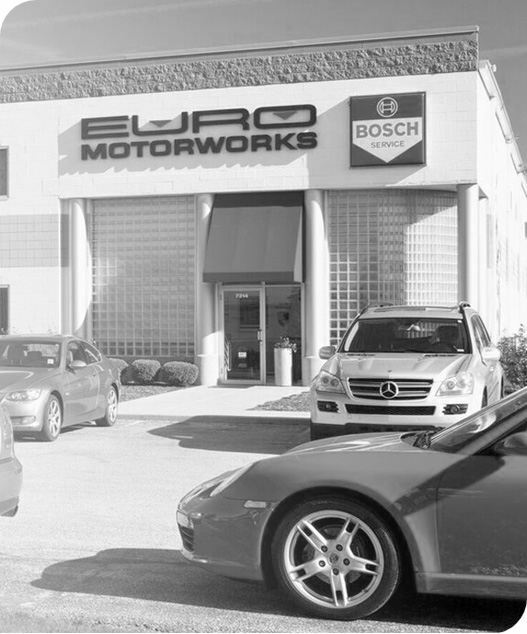 We opened Euro Motorworks, Inc. on August 1, 1993. Both Terry and I had previously been employed by Giganti Porsche Audi VW, the premier Porsche, Audi and Volkswagen franchise in Indianapolis for over 30 years. Terry had been perfecting his skills as the Shop Forman there since 1980 and I was in sales, beginning what would become a life long love of German automobiles. During the summer of 1993 Russ Giganti decided to retire and sell the business to Tom Wood, Inc. Not wishing to make that transition, Terry decided it was finally time to realize a long time dream and go out on his own. He had developed a loyal following of clients at the dealership and it was those same people that gave the business a jump-start during its first months. Euro Motorworks began doing business in a 2,000 square foot leased space on the corner of 89th and Hague Rd. Terry was able to persuade the lead VW Tech at Giganti, Tom, to join him and for the first few months they were the only employees. I came on board full time a few months into the venture. Business grew steadily through the many word-of-mouth referrals and before we knew it we had added three other technicians, a parts manager and an office manager. Our space had more than doubled in square footage, but still, things were getting pretty tight. It was time for a move. During the summer of 1997 Euro Motorworks' new state-of-the-art 10,000 square foot facility was built and the company took up residence there in September of the same year. Terry and I put a lot of time and thought into the design of the building. After years of experience working in various shops, Terry had developed a clear idea of what was functional and safe. We also wanted our Techs to work in an environment that would reflect and enhance their high skill levels. While Terry's main concentration was the shop, mine was the front office area. As a woman, I had often felt uncomfortable with the set up of the typical dealer service center. It was intimidating, even to me, someone in the car business. My goal was an environment more like a professional office and less like a shop. Of course I'm biased, but I think you'll agree what resulted is inarguably the finest automotive repair facility in the Midwest. The Euro Motorworks crew has now grown to thirteen full time employees and one part-timer. Yes, Tom the VW/Audi Tech is still with us, entering into his 48th year of servicing VW and Audi. We’ve added quite a few family members over the years too. Currently, besides Terry and I, our two grown children work in the business. So you see, this isn’t just business to us . . . it’s personal.